Floral appliqued 50's vintage circle skirted dress. Dark gray cotton with pink, gray and black cotton floral appliques. 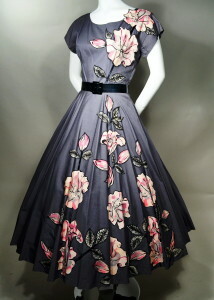 Solid gray dress with bold die-cut flowers appliqued to left side. Flowers sprinkled with rhinestones. Fitted bodice with wide scoop neckline. Cap sleeves. Side metal zipper closure. Full circle skirt. Wonderful vintage dress... makes a statement! Note: Belt in photos not included. Bodice length, measured back from shoulder to waist - 16"
Skirt length, measured back from waist seam to hem edge - 31"
Near excellent condition. Shows some age/soil discoloration at applied flowers and two tiny reinforcement repairs that show only on underside and serve to extend life of vintage garment.